262 pages | 17 B/W Illus. The Arctic and its unique natural resources have become objects of increasing concern. Rapid climate change and ageing of the population are transforming the living conditions in the region. This translates into an urgent need for information that will contribute to a better understanding of these issues. 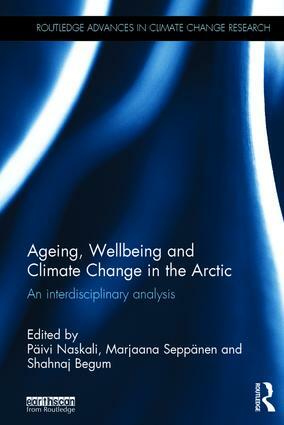 Ageing, Wellbeing and Climate Change in the Arctic addresses the important intersection of ageing, wellbeing and climate change in the Arctic region, making a key interdisciplinary contribution to an area of research on which little has been written, and limited sources of information are currently available. The book explores three key areas of discussion. First, various political issues that are currently affecting the Arctic, such as the social categorisation of elderly people. Second, the living conditions of the elderly in relation to Arctic climate change. Third, the wellbeing of elderly people in terms of traditional knowledge and lifestyles. The book also features contributions from a number of key researchers in the field which examine a broad range of case studies, including the impact of climate change on health in Lapland and elderly people and geographical mobility in Norway. This book will be of great interest to scholars of climate change, gerontology and social policy. Päivi Naskali is Professor of Women’s Studies in the Department of Gender Studies and serves as Dean of the Faculty of Education at the University of Lapland, Finland. Marjaana Seppänen is Professor of Social Work at the University of Helsinki, Finland. Shahnaj Begum is a PhD candidate and researcher at the Unit for Gender Studies in the Faculty of Education at the University of Lapland, Finland.